The following is the oration given by Diarmuid MacDubhghlais at the annual hunger strike commemoration by Republican Sinn Féin in Bundoran, County Donegal on August 25. Is mor an onoir dum a beith anseo ar a ocaid seo. Tamid anseo cun cuimhniu ar na n-daoine a fuair bas ar na stailc ocrais. It is indeed a great honor to be addressing this, the 31st Annual Hunger Strike commemoration here in Bundoran. We commemorate not just those who died in the concentration camp of Long Kesh in 1981 but also Frank Stagg and Michael Gaughan who died in the 1970’s in England and Sean McCaughy, Sean McNella and Tony Darcy who died in the 1940’s in Free State jails. Andrew Sullivan, Denis Barry, Joseph Whitty, who died under Free State rule in the 1920’s; Terrance Mc Swiney, Joseph Murphy and Michael Fitzgerald who also died in the 1920’s under British rule and finally Thomas Ashe who died in 1917 in Mountjoy jail while being force fed. All these men fought and died for their belief in a 32 County Irish Republic. Let us remember too the many who died young as a result of hunger strikes and conditions in many jails in Ireland and England. The hunger strike of ‘81 was a seminal point in the prison struggle and the struggle for a 32 County Irish Republic. For years the POWs in both Long Kesh and Armagh women’s prison were refusing to be treated a criminals and had been refusing to wash or slop out or wear prison uniforms. While the British did engage in talks with the POWs it became clear that this engagement was not genuine and in 1981 a decision was made to undertake a hunger strike. The goal of being recognized as political prisoners was attained but at a high cost, ten men died in Long Kesh and many more men and women had their health ruined due to either the hunger strike or the barbaric act of force feeding. Sadly the hard won victory of political status was sold out by a minority of greedy former comrades later. These men and women couldn’t wait to get their grubby hands on the reigns of power and so for some short term political gain and wads of money they decided to administer British rule in the Occupied Six Counties. We now have Republican prisoners in the Occupied Six Counties and in the 26 Counties because of their political beliefs. They would never have seen the inside of a prison cell had it not been for British occupation in our country and their resistance to that occupation. In the Occupied Six Counties the POW are once again on dirty protest fighting for political status in filthy squalid cells without the most basic of needs. They are locked up approx 23 hours a day, denied education, free association and all the rights associated with political satus. The screws have an interest in the continuation of this protest as it keeps them in high paid jobs. An agreement was reached in August 2010 between the POWs and the prison administration, facilitated by independent people, but this was subsequently subverted by the screws. I call on this agreement to be implemented in full now. Internment has once again raised its ugly head. Martin Corry was released from jail in 1992 having served 19 years and was arrested once again in April 2010 and held without trial since. In July this year his release was ordered by a highly renowned human rights judge in the high court in Belfast, Seamus Treacy, who found the Martin’s human rights had been infringed under Article 5 of the Human Rights Act 1998. But this was not to lead to his freedom. Owen Paterson (British secretary of state) overruled this judgment and martin remains in Magaberry jail. The ruling by Paterson shows that it is the British government that runs the Occupied Six Counties, the Stormont administration is no more than a puppet administration with no REAL powers. During his hearing it transpired that the so called evidence against Martin was so secret that not even Justice Treacy could see it; the book of evidence given to him was an empty book with the words “the secretary of state states this evidence exists”. To date Martin still has not been given a reason for his arrest, he has not been charged with anything. Marian Price is another high profile internee. She has been interned for over a year and a half on a spurious charge. She is now gravely ill in hospital, suffering from pneumonia. There is the real possibility of Marion dying while interned, another innocent victim of British injustice in the Occupied Six Counties. There are of course other internees, some having their licences revoked and some interned by remand. I call on everyone here to do their utmost to highlight this abuse of peoples’ human rights. The British can not be allowed to condemn perceived human rights abuses by others while at the same time abusing the human rights of the Irish. In Lithuania Michael Campbell is incarcerated in a jail that was an actual concentration camp in the Second World War, his toilet a hole in the ground. Communication is almost impossible due to the language barrier. Michael’s sentence of 12 years was appealed by the prosecution. This it seems orchestrated by MI5 so as to impede and effort to have him repatriated to Ireland. His brother Liam is in jail in Maghaberry awaiting extradition to the same jail and the same conditions. The Six-County state and the 26 County-State solution that was imposed on the Irish people over 90 years ago has obviously failed. The 26 Counties is now administered by the descendants of those who sold out in ‘21 - families who now have accumulated huge personal wealth, while ordinary people worry on a daily basis how they will manage to pay for food, clothing and the basics to survive. This year in Cork a young girl collapsed while in school and when taken to hospital it was found that she was malnourished. This seems to be the choice for the people, to pay the bills or to eat, while the so-called representatives in Leinster house send billions of Euro in taxes to faceless/nameless people around the world. 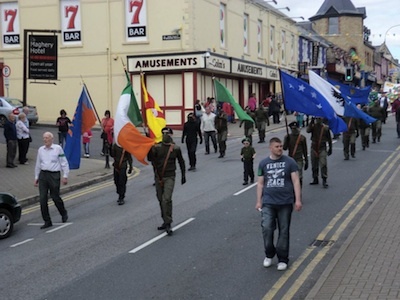 The administration in the Occupied Six County in openly and nakedly sectarian. It is allegedly run by the two biggest parties - the Provos and the DUP. While they have divided up the ministerial portfolios between them they think they have control over their own little fiefdoms - and perhaps they do in a little way. But the truth is the British are their paymasters, Westminster is the real seat of power - and the Stormont ministers will happily do as they are bid. The Unionist veto is alive and well and operating as usual. While Stormont ministers impose cuts on the people they increases allowances to themselves, just like capitalist administrations all over the world. The gap between rich and poor ever widens and until socialist policies like Eire Nua and Saol Nua pertain, that gap will continue to widen and sectarian policies will prevail in Occupied Ireland..
“In Ireland we [the British government] have tried every possible formula; direct rule, indirect rule, genocide, apartheid, puppet parliaments, real parliaments, martial law, civil law, colonisation, lane reform and partition. Nothing has worked. The only solution we have not tried is absolute and unconditional withdrawal”.